Do you like bands of the new millennium? 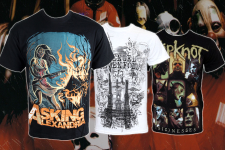 You belong among fans of bands like Asking Alexandria, Slipknot or Avenged Sevenfold? Then do not hesitate and come with us to privileged Package shirts three current drivers of metal, which we now offer a 10% discount!